A gibbet was a gallow that an executed criminal was displayed from to deter further criminal activity. You can read more on caves in Kellymount and the Kellymount gang. Many areas of the world have historical stories about gangs of bandits and robbers. Depending on the evidence consulted, they can be ruthless killers or Robin Hood type folk heroes. Ireland is no different and there are many examples of Tories, highway men and rapparees. One of the most well known bands of outlaws was the Kellymount gang. This group of men committed many robberies in the late 1730s before being captures in 1740. In the fifth volume of his tome on Irish history, Ireland and Her People, Thomas W.H. Fitzgerald refers to the year 1740 as the year of the “Kellymount gang outrages”. The leader of the gang was a man by the name of Brenan. This name is synonymous with the north Kilkenny area. 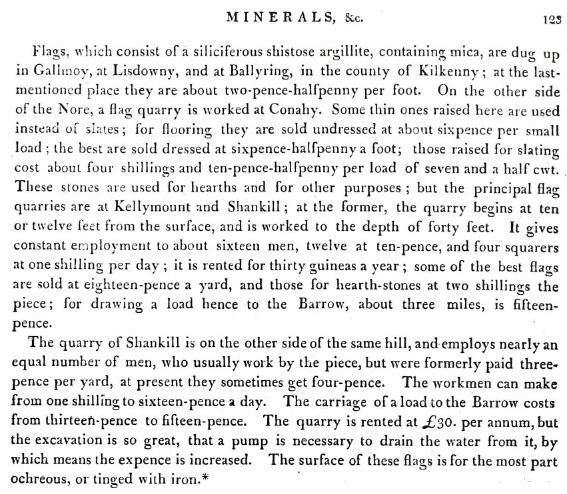 An unflattering account is given of him in Reilly’s Dublin Newsletter of 1740: “Brenan is said to be a man of very mean appearance, has a freehold of nine pounds per year, near the coal pits, but, renting one of the coal pits, and not succeeding, he started this gang”. From 1738-1740 the gang was said to number about thirty men and roamed areas of counties Kilkenny, Laois, Offaly and as far west as Galway. While the gang members seem to have come from many areas of north Kilkenny, their association with Kellymount most likely comes from them frequenting the area. 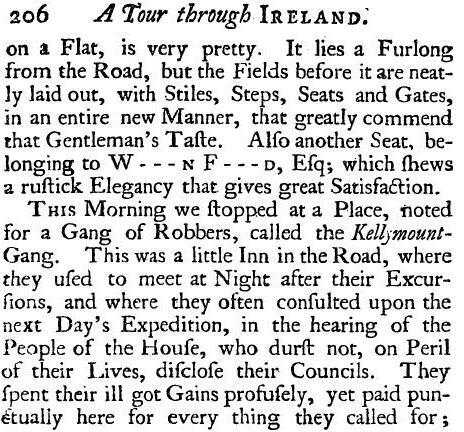 Just eight years after the demise of the gang a travel writer wrote about visiting an inn in Kellymount that the gang used to regularly frequent. Later in the century, a traveler in Ireland reported in 1791 that he was shown a cave in Kellymount that the gang used as a meeting place. Eventually, Brenan, and other gang members were captured in Galway and this led to their demise. He was taken to a jail at Nenagh, Tipperary and then onto another jail at Clonmel, Tipperary. Here, in September 1740, he died of the wounds that he sustained during his capture. Darcy, another gang member, was tried in Carlow and hanged with his head fixed on the courthouse. From the Irish word tóraidhe. Generally meaning a man who is pursued, it was given to soldiers who fought for the Confederacy against Cromwell’s forces and then became outlaws and highwaymen. Fitzgerald, Thomas W.H. 1909. Ireland and her people; a library of Irish biography, together with a popular history of ancient and modern Erin, to which is added an appendix of copious notes and useful tables; supplemented with a dictionary of proper names in Irish mythology, geography, genealogy, etc. Volume 5. Chicago: Fitzgerald Book Company. p.786. MacLysaght, Edward. 1985. The Surnames of Ireland. Dublin: Irish Academic Press. Connolly, Sean. 2008. Divided Kingdom: Ireland 1630-1800. Oxford: OUP. p.321. Madden, Richard Robert. 1867. The History of Irish Periodical Literature from the end of the 17th Century to the middle of the 19th Century. London: T.C. Newby, p.279. During the ravages of The Famine a man by the name of James Fraiser toured Ireland and produced a publication, A Hand Book for Travellers in Ireland. He briefly mentions squalid and wretched poverty when travelling through Galway town but that is the merest of mentions that is given to what was a desperate time to be touring Ireland. One of his journeys takes him from Dublin to Kilkenny, where he travels through Paulstown, calling it “the hamlet of Shankill”. As usual with these publications, the only people that are mentioned are the local gentry. Fraiser, James. 1849. A Hand Book for Travellers in Ireland. Dublin: James McGlashen. Travel writing from the 18th and 19th centuries can offer a very interesting insight into the areas and lands that the writer visits. Instead of the dry statistical accounts a keen insight can be given of the people, characteristics and features of an area. Excursions Through Ireland: Comprising Topograpical and Historical Delineations of Each Province… by Thomas Cromwell was published in 1820 and has a typically wordy title for books of that era. The passage below is from pages 71-73 and contains a very interesting story of how three local men are treated by a passing coachman. The author then gives his opinions on how such coachmen would be treated in England if they tried the same things there. Observations are also offered on the parish of Kilmacahill which show the area to be less well off than other parishes. 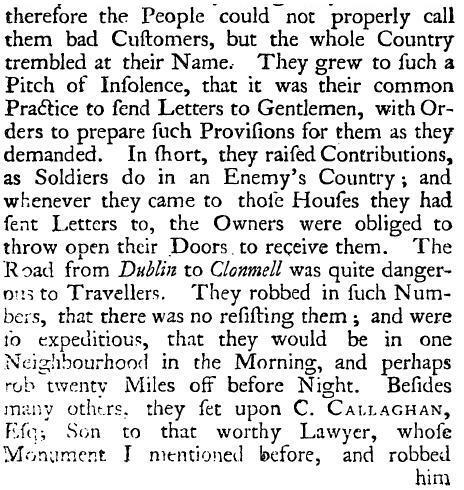 The extracts below are from the whimsically titled A Tour Through Ireland in Several Entertaining Letters written in 1748 by W.R Chetwood. On his journeys Chetwood travels from Cork to Dublin. Over three pages he discusses what seems to be the areas around Paulstown. The passage from the book comes after he has left Kilkenny and before he comes to modern day Bagenalstown and Leighlinbridge in county Carlow. He refers to the ‘seats’ of two men, but for some reason does not spell their name in full. However, A —–D and F—D would correspond with Aylward and Flood, the two principal land owning families in the Paulstown area at the time. The description he gives of the house in which A —– D lives also corresponds with Shankill Castle, where the Aylward family lived. The extracts below are from pages 205-207 of the publication. For a better understanding of some words, the ‘f’ shaped letter should be replaced with the letter s.
 Chetwood, W. R., A Tour through Ireland in Several Entertaining Letters: Wherein the Present State of That Kingdom Is Consider’d … Interspersed with Observations on the Manners, Customs, Antiquities, Curiosities, and Natural History of That Country … London: Printed for J. Roberts …, 1748. Print.